Hey everyone, It's Barb from BugBites. 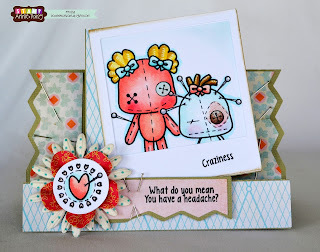 You normally see me here on Mondays but I just had to show you a cute treat holder I did for the upcoming holiday week using a sentiment stamp from the Stamp Annie Thing Party in America Stamp set. 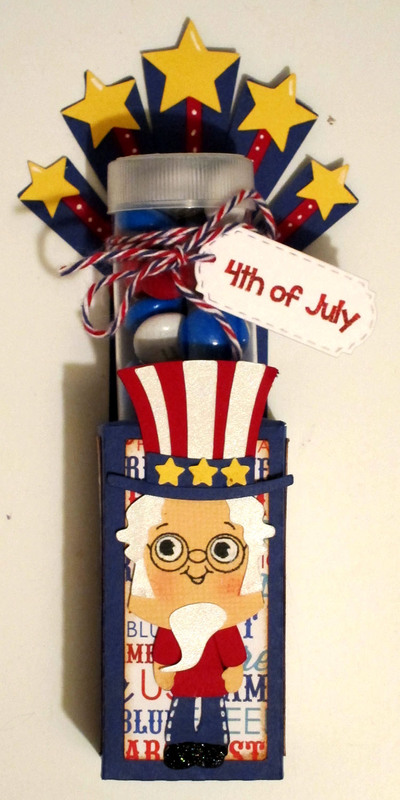 The cute Uncle Sam cute file along with the tube holder box and stars over at SVG Cutting Files. I will be back Monday with yet another patriotic treat holder using another Stamp Anything Thing stamp set. Can you guess which one? Hi everyone! Melissa here today with a slider card using stamps from Stamp Annie*Things's Party in the USA. I just love the images and sentiments on this set. The girl was paper pieced and her skin is colored with Copic Markers. The top of this card is a pull and slides out to reveal a message. Have a great Day and a Fun 4th of July! 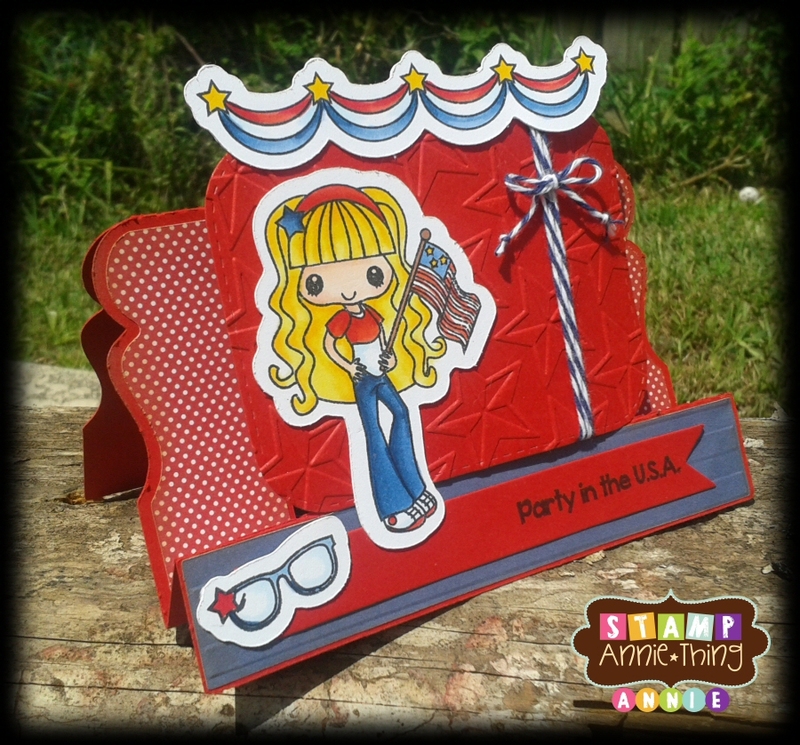 Hi everyone, it's Sherri from The Squeaky Scrapper with today's Stamp Annie* Thing project. 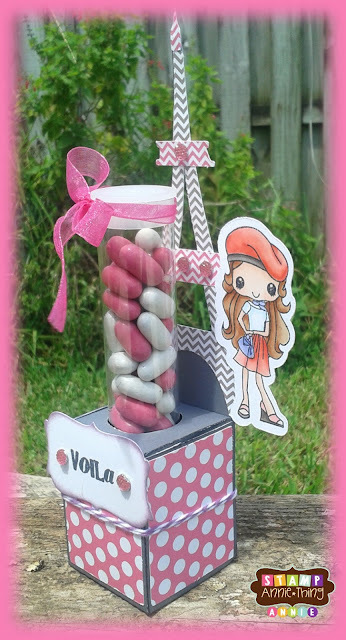 Today I used another new stamp that came out in the last couple of weeks called "Ooh La La". I just LOVE this little girl and her accessories. 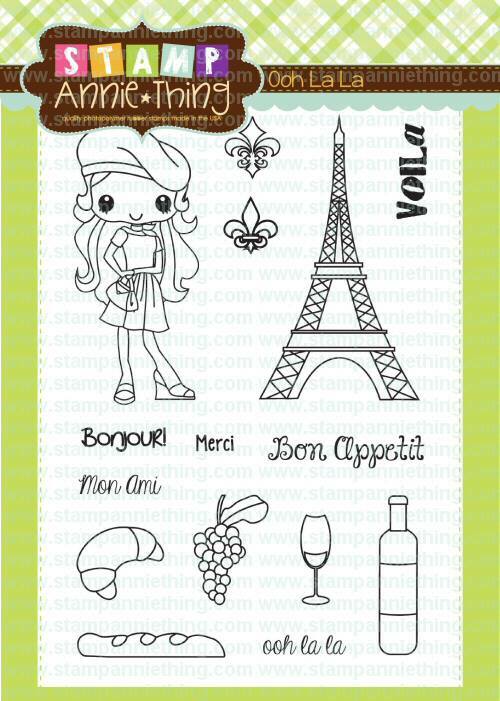 Here's what the actual stamp set "Ooh La La" looks like. Good morning! 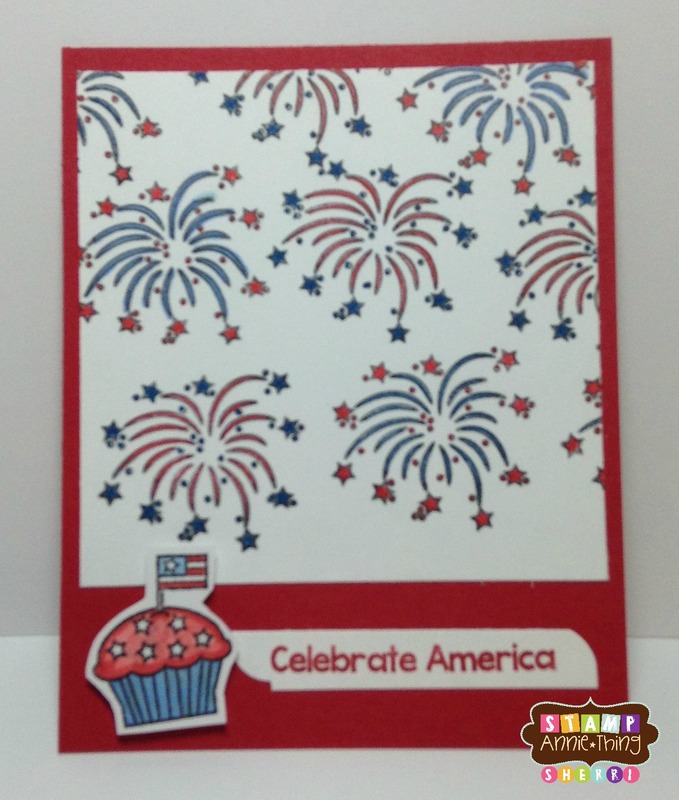 Ruza here to share a Clean & Simple card using the Fun Starts Here stamp set. When it came time to create my project for today, I remembered being inspired by the current Clean & Simple Sketch #246 that I saw over the weekend. So I pulled out all of my stamps and decided to use the Fun Starts Here! To start off I stamped the sweet little girl with Memento Tuxedo Black Ink and colored her with my Copic Markers, and then I used a White Gelly Roll Pen to add the dots to her dress. I made a mask of the girl with a post-it note to cover her up while working with the sentiments. Before I stamped the sentiments I laid them out on my layout, and moved them around until I liked the line-up, that included cutting one of the sentiments. Leaving the sentiments on my layout I put a block on them, inked it up, and wallah the sentiments are perfectly aligned where I wanted them. 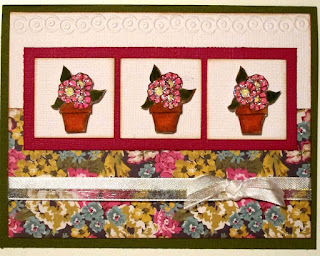 I used 6 of the 8 sentiments that come in this adorable stamp set. Have a look! I hope you are inspired by today's project to head on over to Stamp Annie*Thing Store to check out all of the amazing stamps we have to offer. Happy Monday! It's Barb from BugBites with your Monday Stamp Annie Thing inspiration. Today I used the Dog-gone Cute stamp set. 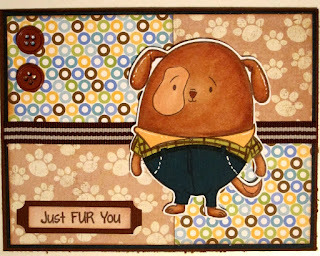 I colored most of the dog with my copic markers and paper pieced his clothes. He sure is cute! Here's a picture of all the stamps in this set. That's alot of stamps in one little set. 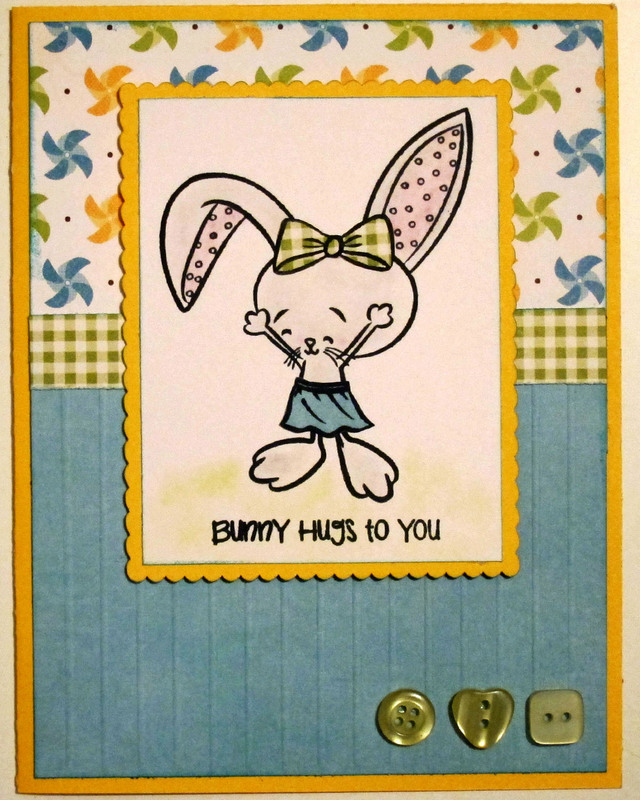 You can stop by and grab this adorable stamp set now, just click here. Have a terrific Monday and I will see you back here next Monday with more creative fun! Happy Friday! 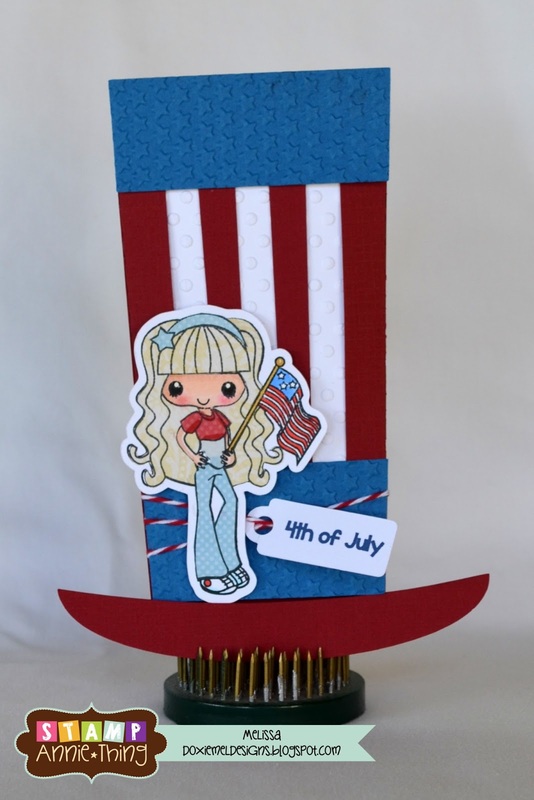 This is Melissa with a fun step card today decorated with the dolls from Stamp Annie*Thing's Voo Doo You Love stamp set. I colored this funny pair with Copic markers and even added some straight pins from my sewing supplies. The button eyes and patch are paper pieced withe the pattern paper from Basic Grey's Fact or Fiction that is also on the card base. I myself suffer from migraines... so I can relate to that doll with the pins in her head. 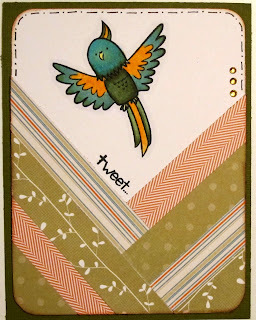 This card is a base at SVG Cutting files, Center Step Card Edged Zig Zag. I felt the zig zag sides added to the "craziness" of this card. I even cut another side panel and used that to frame one of the sentiments from the stamp set. Have a great weekend (without any Headaches) and Happy Stamping! 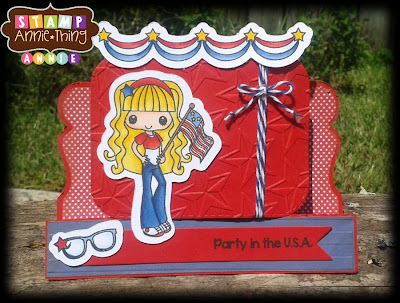 Today I did a project using the new stamp set called "Party in the USA". This set just came out last week and has some awesome graphics that can be used for any occasion. As you can see I used the fireworks - these can be colored in any color which helps them to work for other occasions. 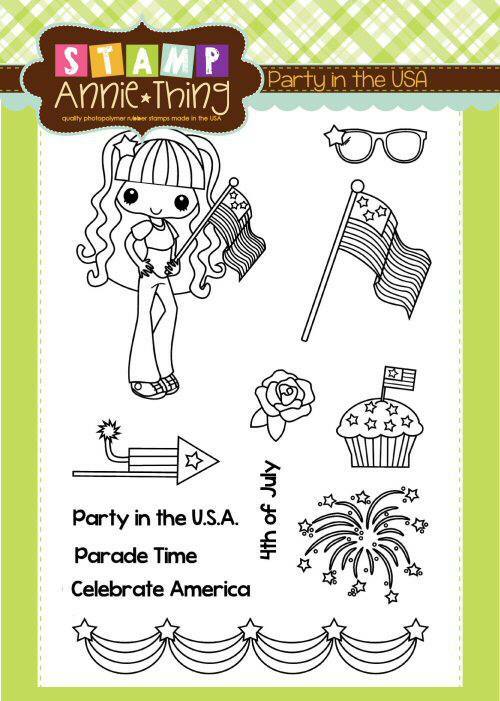 Here's what the actual stamp set "Party in the USA" looks like. Good morning! 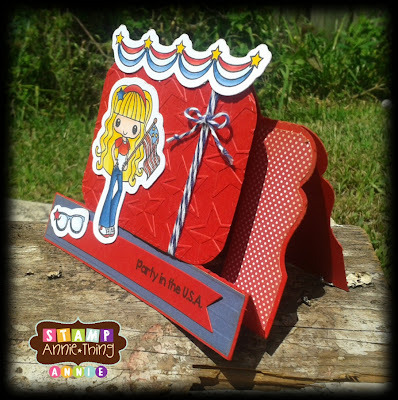 Ruza here to share a card that I created using the awesome NEW Ooh La La stamp set. I created the background with Chalk Pigment Ink and one of the elements available in the set. I decided to use the wine bottle, wine glass, and the bread as the focal point of my card. The images were stamped with Memento Tuxedo Black Ink, colored, and layered on my design. Once done I used a Memory Box Jasmine Frame Die to frame my scene, and added some pearls to the flowers. Last step was to add Glossy Accents to the Wine Bottle & Glasses. I don't want to leave the bottom section empty so I need to add a sentiment, but I'm just not sure which one to use ... there are so many to choose from. Bon Appetit, Bonjour, Merci, Voila ... it's so hard to choose. Blooming with Stamp Annie Thing Stamps! Happy Monday! 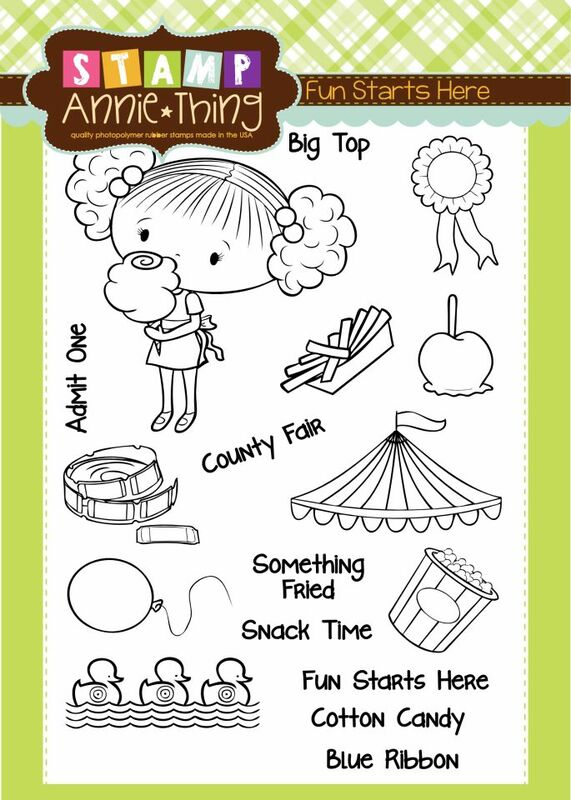 It's Barb from BugBites and I have a very simple but pretty card for my Stamp Annie Thing project to share today. I used a pretty little flower stamp from the For Peep Sake stamp set. I stamped it three times, colored them and cut each out. From this picture it's hard to see that the flowers are popped up on foam tape. I also added some sparkle to the flowers with a glitter pen. Here's the whole set of stamps. Aren't these stamps just the cutest things! 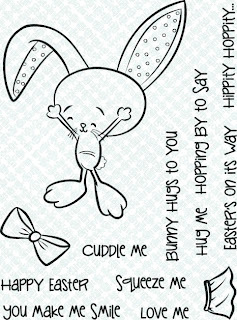 I know this set was release with Easter in mind, but I think this card shows how versatile the Stamp Annie Thing stamp sets can be. Just click here to get your For Peep Sake stamp set too. I will be back Monday with another Stamp Annie Thing stamp project. Have a terrific week! Stamp Release Winners! Party in the USA and Ooh La La! Thanks to all who participated in our mini blog hop release to reveal our 2 latest stamps. We have randomly chosen the 2 following names from the comments on the blogs. Please contact me at sales @ stampanniething.com with your full name and mailing address so we can ship your new stamp set out to you! See you next month for our next reveal hop! Good Morning and welcome to our Mini June Release Party! if you missed DAY 1, you can see it here! My name is Annie and Im the first stop on your mini hop today! 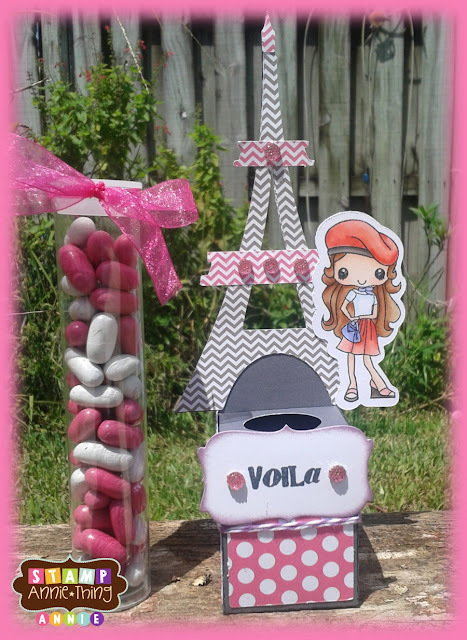 Today we are revealing our newest stamp, Ooh La La. Since France seems to be a BIG thing in crafting these days, I just had to get a France set put together! This is Brittney and she is enjoying her travels in France. Love the Eiffel Tower and the little icon images! This set will be available for purchase Today after 4pm! For todays mini hop, I created a shabby chic Eiffel Tower Candy Tube Treat Holder. I just love making functional gifts as well as personal cards for friends and family. This would be a great party favor for little girls (and big girls) that have a Paris type theme party! I colored my Brittney image with my copics and created this little Eiffel Tower Candy tube. Fill with some PINK treats and Shabby Chic you have! I hope you enjoyed my candy tube treat today! Winner will be announced later today! 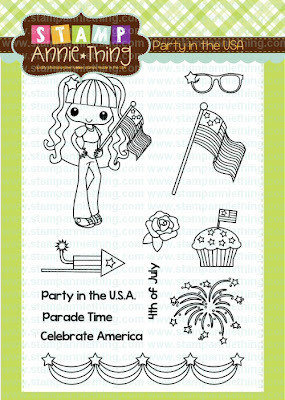 Today we are revealing our newest stamp, Party in the USA. Isnt she just adorable? Her name is Rose, just like the national flower for the USA! 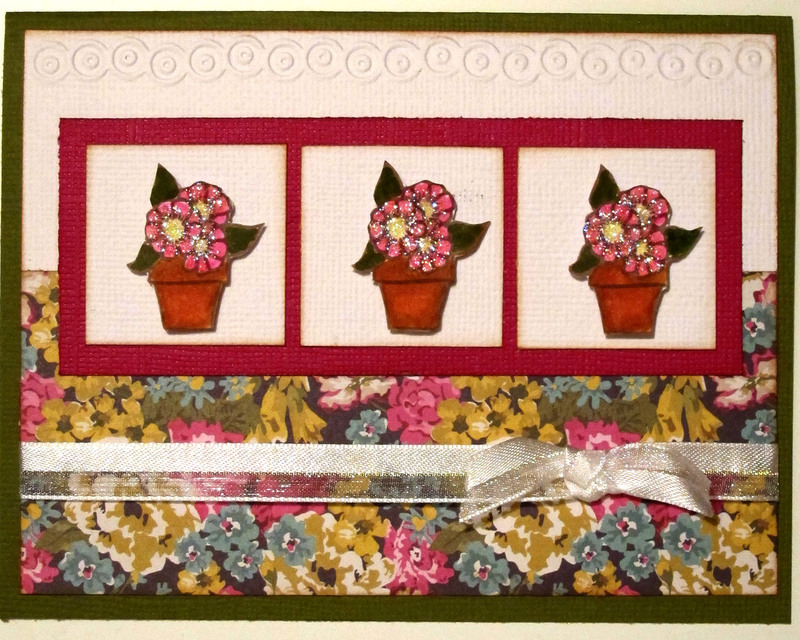 For todays mini hop, I created an adorable step card showcasing sweet Rose and some of the other stamps in the set. 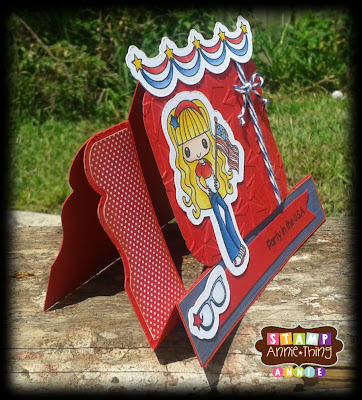 I just LOVE Bunting Flags in the summer, so had to include one in my card! I cut the REALLY easy Decorative Edge Step card and embossed the Journal Die with a Star Pattern (I want to say its a Cuttlebug Embossing Folder, but I honestly can't remember! 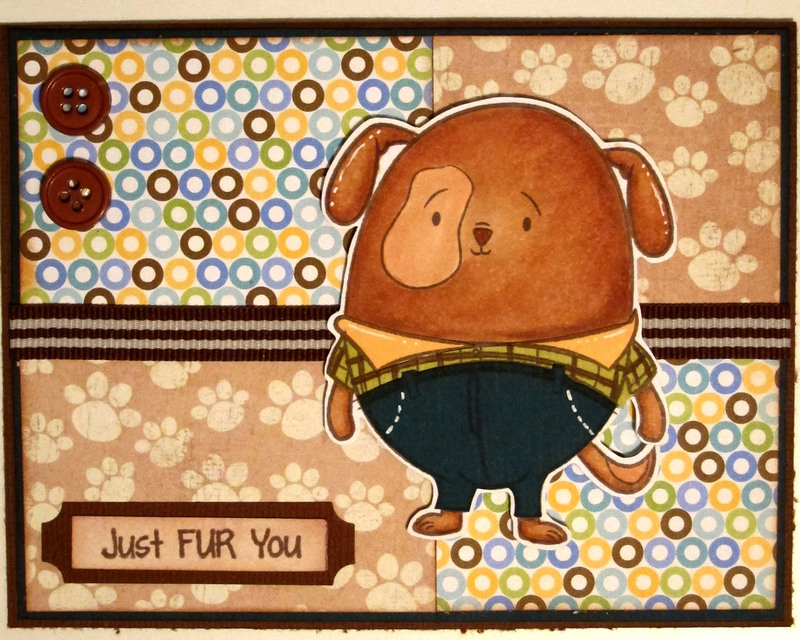 ), Colored my sweet stamps in with my Copics and stuck the whole thing together. It came out so cute and so VERY Patriotic. 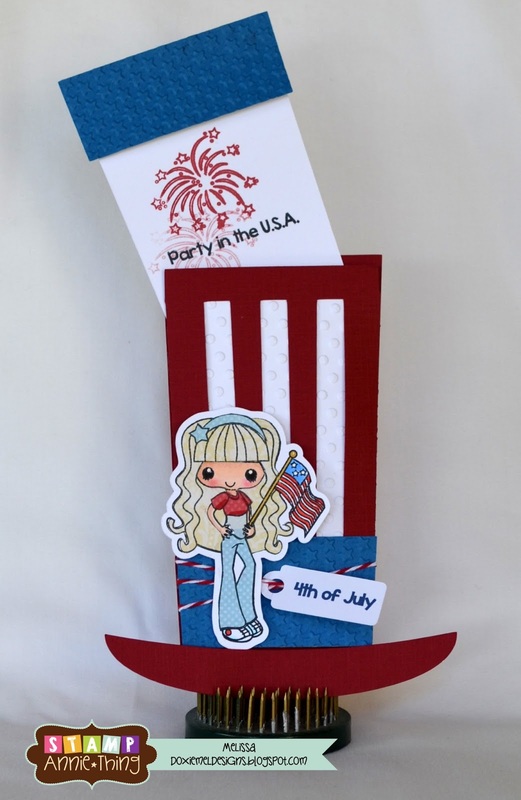 Perfect for an invite to your upcoming Summer Get Togethers, BBQ's or July 4th Parties! I just LOVE the card base for this card! Dont forget to come back tomorrow at 10 am EST to see Day 2! We have some amazing creations to share with you that feature the NEW Stamp Sets being Released on Thursday & Friday! I can't wait to share my creations, and hope you MARK your Calendar to come back and HOP with us! Until next time ... have a marvelous week! Happy or should I say Hoppy Monday! Hope you all had a terrific weekend. 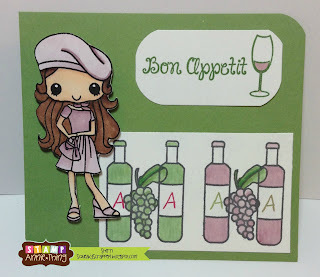 It's another terrific Monday where I get to share another project using Stamp Annie Thing stamps with you. 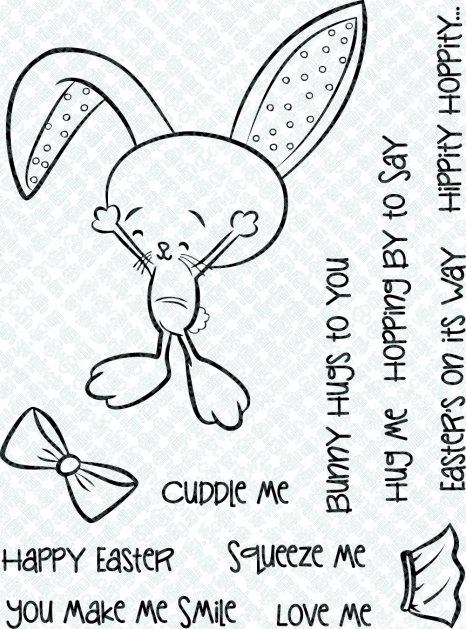 I used the ever so cute Bunny Hugs to You stamp set for today's project. It's a tiny set of stamps but is big on possibilities. I tried something new for this cute bunny. Instead of using my copic markers, I used a q-tip and chalk to add color to my image. It was just enough of the soft color I needed for this little honey. I did do some paper piecing of the bow and the skirt for the finishing touch. Here's the whole set of stamps-- so many great sentiments. 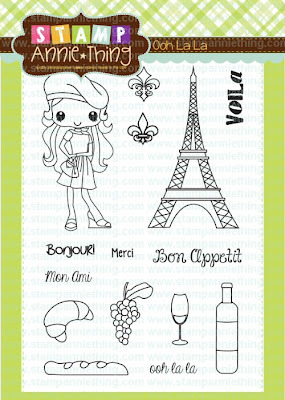 Annie has been working on some new super cute stamps for an upcoming release in a couple weeks. Stay tuned for more about that coming soon! Hello Everyone! My name is Melissa and I am so excited to be here today! This is my first post at the Stamp Annie*Thing Blog. I have a card set to share made with the Our Lil Series. They are 3 by 3 inch cards. The card base is from SVG Cutting Files, Bracket Card Base but I altered the size of the card base for this set. I colored these with Copic Markers and think they are so CUTE! Each stamp set in the Our Lil Series comes with a main image, accent images, and many clever sentiments. Love that peanut and the "fumes" on the skunk tail. 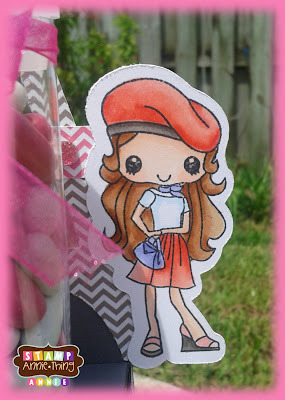 Please check out my blog for more details about these mini cards. Thanks for stopping by today, Happy Stamping! Good morning! 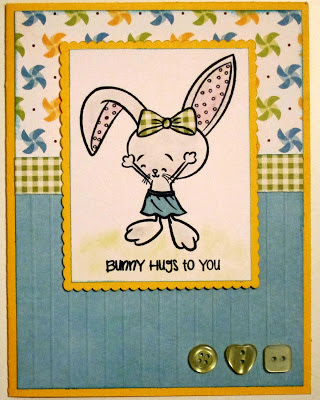 Ruza here to share an adorable card that I created using the awesome Here's the Dirt stamp set. 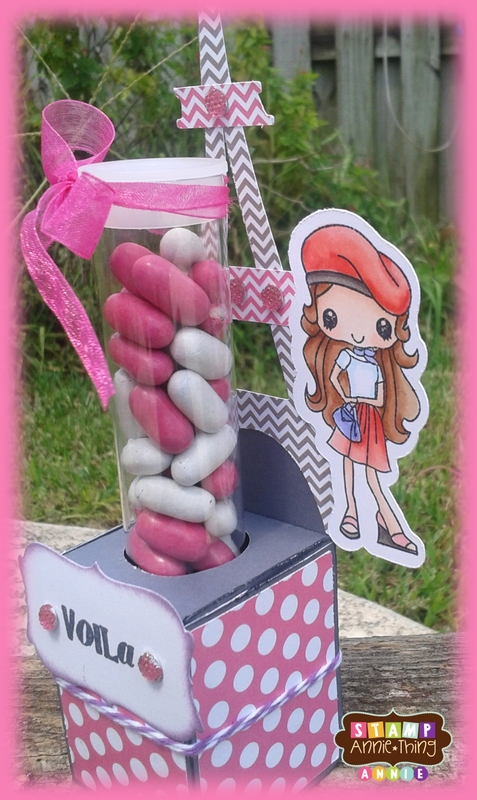 This little girl is so adorable, and so much FUN to create with! I colored her hair and skin, and the tree and dirt with my Copic Markers, and then paper-pieced her clothes with Design Paper. Mark your Calendars to come join us for our NEW Release Blog Hop Thursday, June 13th and Friday, June 14th. 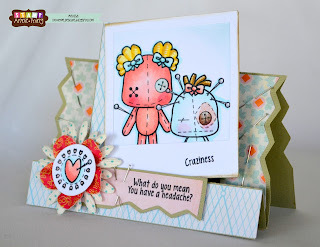 For all the details on what inspired today's design, head on over to Ruza's Craft Corner. Happy Monday! It's Barb with BugBites bringing you another fantastic Stamp Annie Thing Monday project. I hope you all had a fabulous week. Last week was a busy travel week for me. My job took me to the exotic island of Bora Bora!! So, I just had to use the Rare Bird stamp set for my card. It was so fitting. 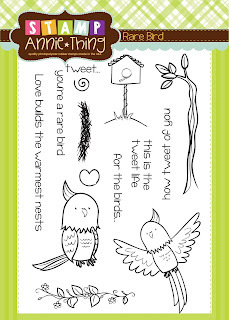 I can't wait to use the rest of the stamps in this set for more "birdie" cards. To see more fabulous Stamp Annie Thing stamps, click here. For more information on how I made this card, visit be at BugBites.